A few weeks ago, the Oxford English Dictionary added a slew of new words to its hallowed archives. Though the mainstream press in the UK focused on the entirely necessary addition of the word Omnishambles (and hopefully soon its new cousin, Omniscrambles), there were plenty of words added that were spawned in the belly of the tech world. Among them Bitcoin, BYOD, Digital Detox, Internet of things, Selfie and even TL;DR. But aside from a few new words in the dictionary, what sort of effect is technology and the internet having on language? TL;DR: The internet and technology have a lot to answer to with regard with their influence on language. Also I am aware that the majority of this post makes me sound like an old man. Stupid made up words: Searching has been replaced with Googling, editing with Photoshopping, pictures with Instagramming & Snapchats. Clouds and viruses don’t mean what they used to, Tweeting has little to do with birds, and so on. There’s also the recent addition of Phubbing , another social faux pas created by technology which could probably form a blog or Buzzfeed list of its own. It’s not an exaggeration to say millennials can talk in front of their grandparents without ever using a word that existed when they were young. This has annoyed the French so much they actually invent their own French-language equivalents to avoid having too many foreign words invade their language; Hashtag = mot-dièse, email =courriel. The endless abbreviations- Whether it’s BYOD (or any number of Bring-Your-Own varients), DR, M&A, or the kind of text/Reddit speak, the act of typing on a keyboard is slowly but surely eroding the existence of vowels and long words. Any child of mine heard to be saying “YOLO” out loud would be quickly put up for adoption. It also turns out all those ‘as-a-Service’ providers aren’t doing a very good job at marketing, you could even say they’ve been talking out their -aaS’s…A recent study by Six Degrees found that 16% of business decision makers think that Infrastructure as a Service (IaaS) was a new road project, while 22% think that Platform as a Service (PaaS) was a new philosophy in railway management. FML. Constant mispronunciation: GIFs bring untold joy to the internet. But when its creator, Steve Wilhite won a lifetime achievement award at The Webby Awards he was apparently perplexed that people weren’t pronouncing it right (It’s a soft G, pronounced ‘JIF.’). Why he didn’t make more of a stand years ago, for example actually getting in contact with the OED, is a mystery. Also, why do we say “P-N-G”, but “Jay-Peg”? Or “Doc-X” but never “P-P-T”? File format phonetics, a linguistic minefield. Text Speak is making kids dumb: While the kids who got their first mobile phones in their mid to late teens may have spent a few years learning correct grammar, the younger generation essentially being given mobile phones and tablets instead of dummies and traditional mobiles are losing the ability to write coherently and use basic grammar. And don’t even get me started on the endless stream of poorly written blogs online. And probably worst of all, those ridiculous startup names: The Wall Street Journal did a bit of research, and found (roughly) 161 startups ending in “ly,” “li” or “lee”, 102 in “ify” or “efy”, 28 in “box” and 10 in “square”. There’s a whole Pinterest page dedicated to the “–lee”s, and it genuinely is almost enough to make you lose faith in humanity. Even if they’re just waiting for Yahoo! to buy them out, a little bit of original thinking doesn’t do anyone any harm, does it? At least use some kind of name generator. Apps that remove vowels are committing similar sins. As an April Fool’s joke this year, South African news outlet News24 proclaimed that Mxlish, the language used on SA Social network Mxit, would become the 12th official South African language. "We are going to start with street signage as this will have an immediate and visible impact and then work towards enabling matriculants to write their final year exams in Mxlish by November 2013," said Xoliswa Nbete, head of the National Languages Expansion Task Team (NLETT) at the Pan South African Languages Board (PanSALB). Funny as it was, is the concept really that daft? Is it only a matter of time before the internet invents its own official language? A recent example of the internet trying to redefine language, one man tried to redefine the word ‘The’. ‘The’ is the most commonly used word in the English language. Paul Mathis noticed this and thought, ‘think how much time we could save if we didn’t have to type out those damn same three letters every time.’ So what did he do? He mixed T and H together and created ‘Ћ’; a new symbol to use in place of ‘The’, and dubbed the "tap" on the Beeb. While it’s unlikely to ever be anything more than a novelty, it’s not the first time the web has popped up with attempts to change our everyday typing habits. There’s even a font with new punctuation marks including a Morgan Freemark. It’s not all bad however. Technology has done some good things too. Aside from obviously connecting people across the world instantaneously, it’s also helped reduce the problems of language barriers, an in more ways than one. Aside from providing linguists with a near-endless supply of data to study, Twitter is also useful for communicating across the world. You can Hashtag all you want, but it turns out that smilies (or emojis) are actually the universal language of Twitter. The most popular ones revolve around love, joy and sadness, showing the generally emotional and bipolar nature of the internet. Whether you think a winky face at the end of the post is actually necessary is entirely up to you. 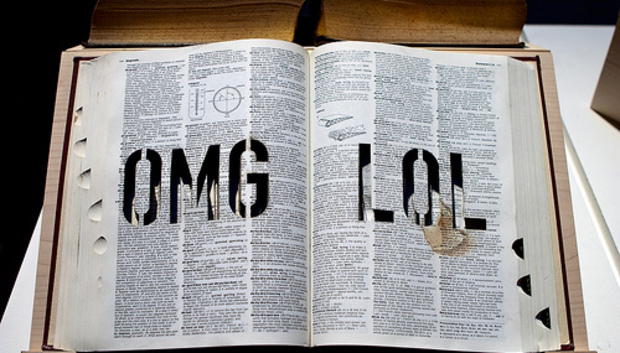 A French company have developed an analytics tool that detects sarcasm. Siri and Google Glass understand what you are saying to them, and even throw in a bit of dry robotic humour in there. It’s an unavoidable fact that technology, and the internet in particular, has a lot to answer for, but it will also have a big part to play in our future. Does LOL-speak grind your gears? Confused by endless abbreviations and poorly-monickered startups? Vent your spleen and comment below. What's difference between project management and change management? Are you ready for remote project management?